Birthday Best To The Late Lord Carson By Michael Fenrich: I am the writer of this story. Before I became a freelance writer writing about horse racing I had the greatest experience of hot walking thoroughbreds. Hall of Fame trainer D. Wayne Lukas gave me that opportunity. While working for Mr. Lukas I walked the late great sire Lord Carson Every morning I worked they gave me Lord Carson to walk the shed row at the stable. The owner of Lord Carson was the late David P. Reynolds. Reynolds was CEO of Reynolds Metals that his father Richard founded. Everyone in households knows them because of Reynolds Aluminum and Wrap. Just like a family pet I got attached to Lord Carson. He was my favorite to walk. “Lord Carson was a super fast terrific looking horse,” said trainer Todd Pletcher. Pletcher knew Lord Carson because he was the assistant for Lukas before venturing on his own. He walked so gently and slowly at the barn, when I walked him he would pull me to his water bucket. Lord Carson was born or foaled on February 20,1992. Every January 1 thoroughbreds increase in age. It is easier to keep track of their ages for different age races. He would be 24 this year on Saturday, February 20, 2016. I am writing this as a tribute to him. His father (sire) was Carson City, his mother (dam) was Bedgays Lady. Lord Carson was a stallion at Vinery and finished his stallion career at Tommy Town Thoroughbreds in California. On March 16, 2005 Lord Carson died from a breeding injury. Even though he is gone his offspring are running at many tracks. Sires Tannersmyman and Windsor Castle are just a few of his sons, their offspring are now running and continuing the legacy of Lord Carson. 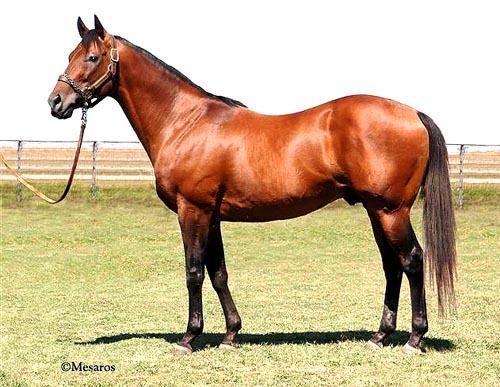 Every time I read the racing forms and see races on TV or in person I am amazed and honored that I have a connection to these horses that are running for the late great sire. Former jockey Donna Barton Brothers who rode Lord Carson is now an analyst for NBC, NBCSN, and TVG. During NBC Triple Crown coverage Brothers is on horse to interview the jockeys and she interviewed Victor Espinoza after he won the Belmont with American Pharoah to become the 12th Triple Crown winner. Donna is working on a book for the future and this excerpt is about Lord Carson. Lord Carson was a powerhouse. The first time I got to ride him was in November of his three year old year and he was already built like a six year old. By that I mean he was filled out-strong and powerful-like an older horse. And he had the body awareness of a mature horse too. And confidence. He was a bay horse and he had a swagger. He walked slowly, purposely, with the confidence of a lion and a kind demeanor. Young horses (two and three year olds) look to you for a lot of information and guidance but as they get older they understand what they’re capable of, they form opinions and how they want to approach a race. That is to sat they decide if they want to go to the lead, stalk another horse, or drop back early and make one late run.. Lord Carson approached a race with the confidence of a veteran and he was determined to take control of a race early and see if anyone could catch him. Mind you, some speed horses go the lead early because they’re either running scared and afraid to be surrounded by other horses or because that’s all they care about: going as fast as they can as long as they can. Lord Carson showed speed and used it tactically as a weapon. He didn’t need to go as fast as he could and he clearly wasn’t running scared. Other horses didn’t intimidate him and he used his speed wisely and with intimidation. He was just so damn cool. I had worked him several times before I got to ride him in a race, so by the time I rode him in the afternoon, I already knew him quite well. My first race on him was in the Aristides Handicap at Churchill Downs in July 1996. 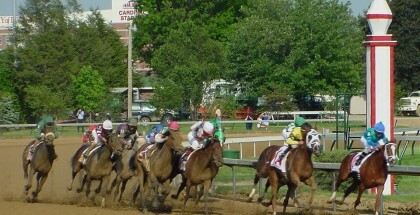 It was only a five horse field and Lord Carson and Quixote’s Luck (Calvin Borel up) were the speed of the race. But, as I mentioned, Lord Carson was a big horse and, consequently, it took him a jump or two to get into position away from the gate. Smaller horses have more room in the gate and can get into a better breaking position, with their but pushed up against the back tail gates. A large horse like Lord Carson takes up the whole gate so they need a step or two to accelerate. It was because of this that Quixote’s Luck out broke us. We were in the #2 post, he was in the #4 post. His rider, Calvin Borel, made the poor decision to use his horse’s quick break and Lord Carson’s slow one to his advantage and he hustled Quixote’s Luck to the lead and, while doing so, across the path of Lord Carson as he made a beeline for the inside rail. Bad choice. Of course, there’s no way Calvin could’ve known how much he would piss off Lord Carson. At the time that Quixote’s Luck crossed in front of us, Lord Carson was just getting into stride and was forced to jump his heels, a move he did all on his own without prompting from me. It was in this moment that I saw another side to my kind, confident, friend He was pissed! When he got to the right side of Quixote’s Luck’s hind legs with his front legs, he leapt into stride with fierce determination and what could only be described as clear irascibility. Within 3 strides we were along side Quixote’s Luck and for the first (and only) time ever, Lord Carson began to lug in, meaning, he was leaning to the left and, in this case, trying to rub up against Quixote’s Luck or, better said trying to run into Quixote’s Luck. It took much effort on my part to keep him from running into the other horse (I couldn’t let him hit the other horse or,if we finished in front of him, we would likely be disqualified and placed behind the horse we bothered) but it didn’t last for long. The intimidation tactic worked well and Quixote’s Luck quickly spit the bit and dropped back and Lord Carson inherited a clear lead. Once in front by himself he relaxed into his long, confident, stride, pricked his ears forward and seemed to enjoy his view. When we turned for home the rest of the field was beginning to approach us and it was time to see if Lord Carson had another gear left to hold our position. 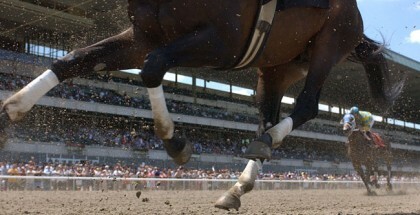 The first thing a jockey does when they ask a horse for acceleration is lower the body. This change in body position signals to the horse that you’re ready for more effort and this is done even before you begin to throw more crosses in your reins or use your whip. As soon as I lowered my body a few inches Lord Carson accelerated and his stride lengthened so far and so powerfully that his body literally lowered four or five inches. It was the most amazing feeling. Not all horses do this, in fact,very few do. But when they do, oh man, it’s the best feeling in the world. They literally drop a few inches underneath you and accelerate simultaneously. And you drop into the sweetest spot of pure joy and pleasure that you can get while riding a horse. Maybe ever. When he did this I had no doubt that he would win. He did. Under a hand ride. No additional encouragement required. Man I love that horse. After the race, Calvin told me it was a bad move on his part to rush to the lead and to the rail because Quixote’s Luck hates being on the inside. Of course when he came up with that game plan he probably figured that once he established a clear lead, we would be content to sit in a stalking position, just off of his hip. He just didn’t know how much he would piss off Lord Carson. Thank you Donna for this insight of how Lord Carson was on the track. I only took Lord Carson to the races in the afternoon as a hot walker a few times. When I was at the races with him I was so proud. I couldn’t believe I was walking next to such greatness and how I was able to help him after the race. I want to thank Mr. Lukas for letting me walk such majestic horses. Happy Birthday Lord Carson. I miss you a lot my walking partner. Can Nyquist Buck History To Win Kentucky Derby?